Ghana election commission website hacked! Hackers have targeted the website of Ghana's electoral commission as votes are counted after tightly contested elections. The commission says the website is up again, and an attempt to put up "fake results" failed. In a tweet, it urged people to ignore the "fake results" circulating on social media. President John Mahama is facing a strong challenge from main opposition leader Nana Akufo-Addo. 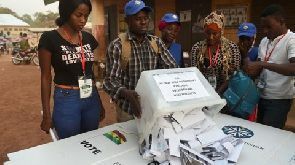 Wednesday's election passed off peacefully, but voting was postponed to Thursday in one constituency after voting material failed to arrive on time. A run-off will be held later in the month if neither of the two main candidates secures more than 50% of the votes. The campaign was dominated by Ghana's faltering economy. In the previous election in 2012, Mr Mahama defeated Mr Akufo-Addo by less than 300,000 votes. "We deplore the attempt to hack the EC's [electoral commission's] website. Please respect the integrity and independence of the EC," it said in a tweet. The website was offline for about four hours, but the commission had not put up results overnight so there was no chance of any tampering, a spokesman told the BBC. All seven candidates have pledged to keep the process peaceful but an opposition supporter died when a rally turned violent on Monday. Final results are expected in the next two days, although provisional results from constituencies are being released. The candidates signed a pact last week vowing to follow electoral rules and keep the peace. Clashes near the border with Togo on Monday left one person dead and six in a critical condition. Defeat for Mr Mahama of the National Democratic Congress (NDC) would make him the first incumbent to lose an election since Ghana returned to multi-party democracy in 1992.
promise of creating more jobs. Mr Akufo-Addo has promised free high-school education and more factories, but his critics have questioned the viability of his ambitions. The other four candidates include former first lady Nana Konadu Agyeman-Rawlings of the National Democratic Party (NDP), whose husband Jerry John Rawlings initially took power in the 1979 coup. She is the first woman to run for president in the West African country.